If you are a lover of tequila, a trip to the Mexican Caribbean—and especially Playa del Carmen—can feel a little like being a kid in a candy store. 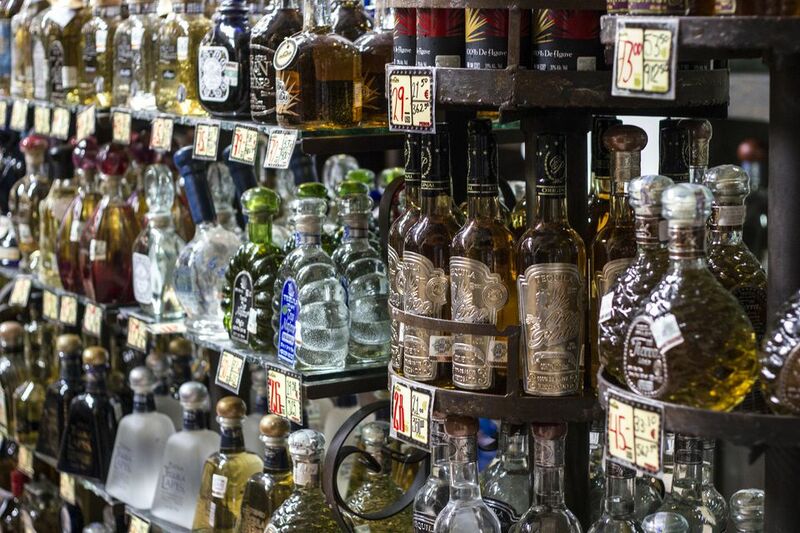 The seaside city's main drag, Fifth Avenue, is lined with tequila shops stocking literally hundreds of varieties of blanco, resposado, and anejo tequilas, as well as mezcal. One of our favorite shops is the Tequila Museum which, true to its name, features a small exhibit in the back of the store on how tequila is made from the native agave plant. An interpretive guide even offers a short lecture on the traditional manufacturing and distillation process, including the opportunity to examine an agave plant. The Museo Sensorial del Tequila in Cancun's hotel zone, a project of Herradura Tequila, is also worth a stop to learn about tequila's history; if you're heading out to the island of Cozumel from the port in Cancun, the Hacienda Antigua runs daily tequila tours, too. And, of course, there are tequila tastings at the Tequila Museum and other local shops like Hacienda Tequila (in Playa and Cancun) and Tequila Town. However, the experience can be a little overwhelming, even if you are a tequila lover. It definitely helps to have a basic knowledge of tequila to help guide your buying: otherwise, you may fall into the trap of just picking the one in the prettiest bottle, which may not necessarily mean the best tequila. It's a blast to cruise the aisles of the tequila shops in the Riviera Maya; you should take as many samples as offered and ask lots of questions before buying. The bilingual staff are more than happy to help guide you along. However, you can generally get better prices, though less selection, at the local WalMart in Playa, and duty-free at the Cancun airport is another smart money-saving option. The first rule of buying tequila is to look for those that are 100 percent agave—a guarantee that you're getting real tequila that hasn't been mixed with other, cheaper alcohol. Blanco (a.k.a. silver, plata, white, or platinum): Clear blue agave liquor that has not been aged. The strong flavor makes it excellent for cocktails. Gold (a.k.a. Oro or Joven): generally less expensive tequila with added colors or flavors, although some are a more upscale blend of blanco and aged or resposado tequilas (see below). Resposado: golden tequila aged in barrels or steel tanks for 2-11 months. Anejo: dark amber tequila aged for at least one year. Extra Anejo: dark tequila aged for at least three years. Mezcal is a strong spirit distilled from the maguey plant, another type of agave. It is mezcal, not tequila, that traditionally contained a worm, though not all mezcal does. It is typically consumed as a straight shot, not mixed. "For beginners, the best recommendation is a good, cold tequila reposado, as this will help the tequila taste smoother without the alcohol overpowering its flavor," says Omar Lopez, bar manager at the JW Marriott Cancun Resort and Spa, which stocks more than 100 tequilas at its lobby bar. "If one prefers their tequila at room temperature, a good Don Julio Reposado with a little lime and salt is the way to go." That's a nice pick if you're not currently in the Mexican Caribbean, as Don Julio can be easily found in most U.S. liquor stores. There are low, middle, and high-end choices of both tequila and mezcal. "There are thousands of brands of tequilas, but it's not to say that the most expensive is the best," Lopez says. "Tequila is to be chosen for its flavor, texture, and elegance, but never for the price." Maestro Reposado or Anejo: by the cocktail at the JW Marriott or at Cancun airport duty-free for about $40. Casa Azulejo Anejo: about $125 in Playa. Tres, Cuatro y Cinco: an ultra premium blend of 3-, 4-, and 5-year-old tequila. About $500 per bottle. "For demanding palates, I recommend a quality tequila, such as Jose Cuervo Reserva de la Familia, best known as the cognac of tequilas. Better yet is Herradura Supremo Extra Añejo," adds Lopez. The Margarita is by far the world's most popular tequila drinks, and you can get some fine, hand-crafted cocktails poured in the restaurants and bars of Playa. The Tequila Sunrise, a mix of tequila, orange juice, and grenadine, is a well-known eye-opener, as well. More authentically Mexican is the Paloma, a mix of tequila and grapefruit soda. Even more traditional is Sangrita, which you can buy bottled, make fresh yourself, or enjoy at a bar. Tequila and mezcal are both made from agave, so what's the difference?